Little Manistee steelhead spawning in an Ohio steelhead tributary of Lake Erie. The steelhead of Lake Erie are truly a mixed bag with Pennsylvania, New York, Ohio, Michigan and the Canadian Province of Ontario contributing both hatchery based and naturally reproduced steelhead to the Lake Erie fishery. Pennsylvania contributes the largest number of steelhead to the Lake Erie fishery with the Pennsylvania Fish & Boat Commission (PF&BC) and local sportsman’s cooperative nurseries (such as the 3-C-U) stocking an average of 1.2 million steelhead yearlings into 11 Pennsylvania Lake Erie tributaries over the last 5 years. The juvenile steelhead stockings are done in early spring prior to “smolting” with the theory that the steelhead will chemically imprint to the specific tributary watershed they are implanted in. Smolting steelhead lose their oval parr markings and coloration and turn predominately silver before migrating to the Lake Erie shoreline in late spring. A good number of the 1,157,968 steelhead stocked in Pennsylvania’s tributaries in March of 2008 (considered 2007 year class by biologist's) will return, after spending two full summers in Lake Erie ("two-lake-year" fish), as mature adult spawners in the fall and winter of 2009. Walleye predation can result in juvenille steelhead mortality as high as 90 % and variability in Lake Erie forage base can effect steelhead survivability and growth rates as well. A smaller number of “jacks” (mostly males) from that 2007 year class already arrived in the fall 2008. A large percentage of the "two-lake-year" fish arriving this fall (2009) will be females (averaging 24 inches and 5 pounds). 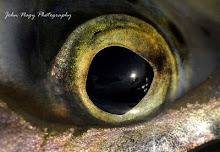 A smaller number of "three-lake-year" fish wil also enter the Pennsylvania tributaries this fall (both virgin and repeat spawners) and will also be predominately females (averaging 26 inches and 8 to 12 pounds). Lake Erie steelhead reach sexual maturity much quicker than other Great Lakes steelhead due to the relatively warm waters of the shallow Lake Erie. Lake Ontario and Lake Michigan steelhead tend to be older/bigger fish (versus Lake Erie steelhead) due to the cool water of these deeper lakes which slows growth rates to sexual maturity. This analagous to the brown trout of Lake Ontario, which on average are bigger than the lake run browns of Lake Erie. Through the continual collection of eggs from returning spawning steelhead over the years the PF&BC has been able to develop a unique, “naturalized” Lake Erie hatchery strain of steelhead that has adapted very well to the Lake Erie ecosystem. Not a pure strain steelhead by any means, it has a varied genetic background including winter run Washington strain, summer run Skamania and domesticated rainbow which is a spring spawner. Very satisfied with the performance of the Pennsylvania strain, the PF&BC no longer receives shipments of steelhead from other fishery agencies not only to maintain its successful natural strain but also to protect its hatchery system from potential disease problems. The varied genetic background of the Pennsylvania strain (they are affectionately known as steelhead “mutts” by Pennsylvania steelheaders) strongly influences their “run” timing with a small number of steelhead moving into the Pennsylvania tributaries early in the fall (late August and September), a large number arriving in fall through winter (with November the peak of the run) with a smaller number of fish arriving in the spring. In order to help spread the run out over the course of the year the PF&BC starts collecting and fertilizing eggs in the fall continuing into late winter. This results in steelhead of different age maturities for that year class. The majority of Pennsylvania strain steelhead start spawning in March, after the lake shore and tributaries thaw and the days progressively start to get longer. Spawning activity is over by late April with most steelhead dropping down to the lake by early May. Because of the strong fall running nature of the Pennsylvania strain steelhead, the PF&BC began stocking the upper part of Conneaut Creek to help Ohio develop a fall steelhead run on the Ohio portion of the tributary (Ohio steelhead runs are primarily late winter/spring run fish). Although the stocking was primarily done to take pressure off some of the high pressured tributaries like Elk and Walnut Creeks in Pennsylvania and encourage steelheaders to fish the upper part of Conneaut Creek in Pennsylvania (which has public access). It is no secret that many Pennsylvania steelhead end up as strays or free “roamers” contributing good numbers of fish (particularly in the fall) to both Ohio and New York tributaries. Since fin clipping is not a standard practice done by the Lake Erie state fishery departments anymore (Ontario and Michigan did some limited fin clipping in 2005) there really does not exist any hard fishery data to support this. This could all change in the near future with the federal Great Lakes Restoration Act which has approved a mass marking program (managed by the Fish & Wildlife Service) for tracking steelhead. The marking program will include adipose fin clippings and code wire tags which are embedded in the nose of the steelhead and require harvesting of the fish to read the tag. The data collected will be used to help better manage steelhead and salmon fisheries in the Great Lakes. Congressional funding for the program is hoped for in 2009 with tracking to begin in 2010. “Recruitment” from the survival of naturally reproduced fry and smolts in the Pennsylvania tributaries does exist but is limited primarily by summer tributary temperatures. High water temperatures can be lethal to juvenile steelhead due to poor stream canopy (that helps to reduce tributary temperatures), low base flows in the summer months as well as limited cold spring sources. Water quality and aquatic food sources also may be limiting factors to juvenile survival. The Ontario Ministry of Natural Resources (OMNR) has a totally different management approach to its steelhead program when compared to Pennsylvania which is obviously based on a vigorous seasonal stocking program. The OMNR estimates that 90% of the steelhead runs in southern Ontario are a result of natural reproduction. Most southern Ontario steelhead tributaries and feeders are fed by cold water ground sources through sandy/gravel bottomed streambeds. They also have excellent water quality, are very fertile and contain a variety of aquatic insect life. All these characteristics provide prime conditions for both natural reproduction and juvenile survivability for not only steelhead and salmon but also resident stream trout. Because Ontario’s steelhead tributaries have ideal habitat for natural steelhead reproduction, the OMNR management policy is committed to protect and enhance them for the future and do minimal (if any) stockings. Limited stockings in the past by the OMNR with a wild, naturalized strain of steelhead from Lake Ontario called the Ganaraska strain (36,500 in 2008), have included tributaries such as Big Creek to jump-start and rehabilitate a declining run and Lake Erie stockings to promote a lake shore steelhead fishery. The New York State Department of Environmental Conservation (NYSDEC) in 2008 stocked approximately 269,800 steelhead juveniles into its New York’s Lake Erie tributaries. These steelhead were obtained from the NYSDEC Salmon River hatchery in Altmar, NY and are of Chambers Creek strain origin. They are now commonly known as Salmon River strain, a naturalized Lake Ontario hatchery strain of steelhead which is primarily a late fall/winter and spring run fish. The Cattaraugus Creek in New York received 90,000 juvenile steelhead plantings in 2008 but also contains a good number of wild steelhead that run the river (documented as high as 30%). Since 2005 the NYSDEC has been doing spring experimental stockings of surplus Skamania strain steelhead into the "Cat" (obtained from the Salmon River hatchery). Approximately 9,800 were stocked in 2008. According to Fisheries Biologist Jim Markum of the NYSDEC, these plantings of Skamania (a summer run fish) will hopefully move into the river earlier (late August and September) to supplement the existing Salmon River strain run which starts later (October). To help track these fish, about half were adipose and left ventral fin clipped. For years the Ohio Department of Wildlife (ODW) had been trying to develop a successful steelhead program for its numerous steelhead tributaries. After the disappointing return and growth rates of London strain stockings (more of a domesticated rainbow) they hit pay dirt in 1989 when they began stocking Little Manistee strain steelhead. Obtained from Michigan Department of Natural Resources in exchange for catfish, these steelhead are a naturalized Lake Michigan wild strain fish (egg source is obtained from wild returning steelhead in the Little Manistee River, MI). The ODW found the Little Manistee strain superior in growth, return rates (3.5 to 1) and length of run versus their hatchery raised London strain fish. 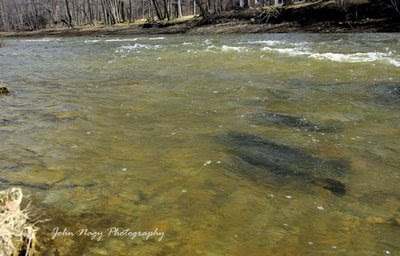 Little Manistee’s are primarily a late winter/early spring run steelhead with the peak of the run in the Ohio tributaries in late March through late April. In the spring of 2008 the ODW planted a total of 465,347 steelhead juveniles into the Vermillion, Rocky, Grand and Chagrin Rivers and Conneaut Creek (the majority of these fish are expected to return in late 2009/early 2010). The Michigan portion of Lake Erie has a large tributary called the Huron River that has been receiving successful plantings of Little Manistee strain steelhead by the Michigan DNR, averaging about 60,000 since 1998 (65, 959 in 2008). 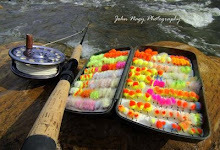 Like the Ohio steelhead tributaries, it is primarily a late winter/early spring fishery. 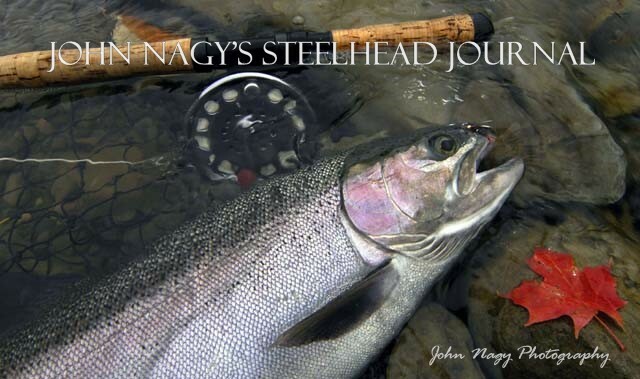 More detailed information on the steelhead of Lake Erie can be found in John Nagy’s book “Steelhead Guide, Fly Fishing Techniques and Strategies for Lake Erie Steelhead”.